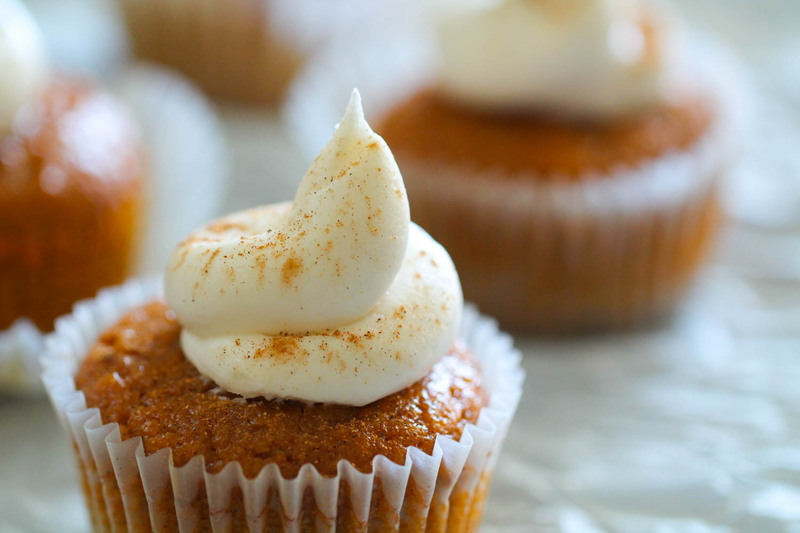 These Pumpkin Pie Cupcakes have all the delicious flavor of pumpkin pie in a cupcake! We love the homemade soft pumpkin cake topped with fluffy buttercream frosting. These cupcakes will be a hit at your next holiday party! I love baking just about anything with pumpkin, however I have never been a huge fan of pumpkin pie because I don’t love pie crust. 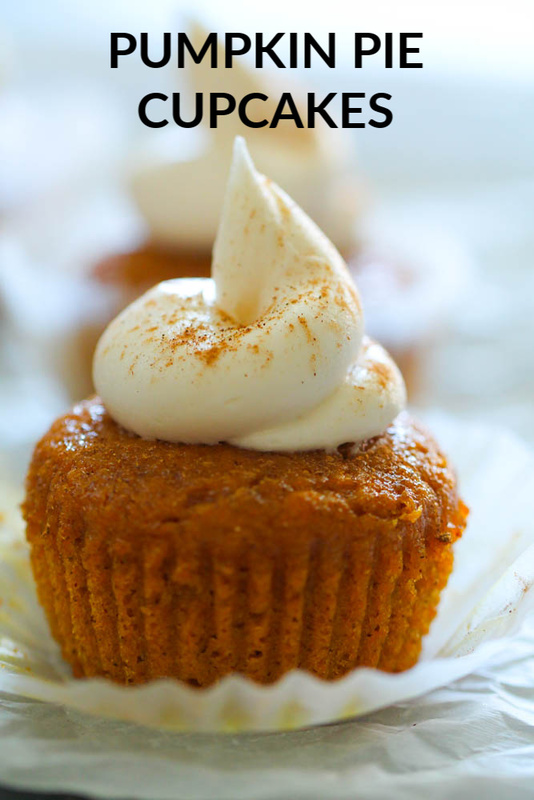 These Pumpkin Pie Cupcakes are the perfect pumpkin treat because they have all the flavor of pumpkin pie but you don’t have to worry about dealing with pie crust. What spices are used in Pumpkin Pie? The most common spices used in pumpkin pie are cinnamon, nutmeg, ginger, allspice and cloves. These Pumpkin Pie Cupcakes have pumpkin spice in them, which is a combination of all of those ingredients. Preheat oven to 350 degrees F. Line a muffin tin with paper liners and spray nonstick cooking spray over the top of the pan and liners; set aside. Typically, when you use cupcake liners you don’t need to use nonstick cooking spray. These Pumpkin Pie Cakes have a different texture than most cupcakes, so to avoid having any part of them stick to the liner, you’ll want to make sure your liners have been sprayed with nonstick cooking spray. 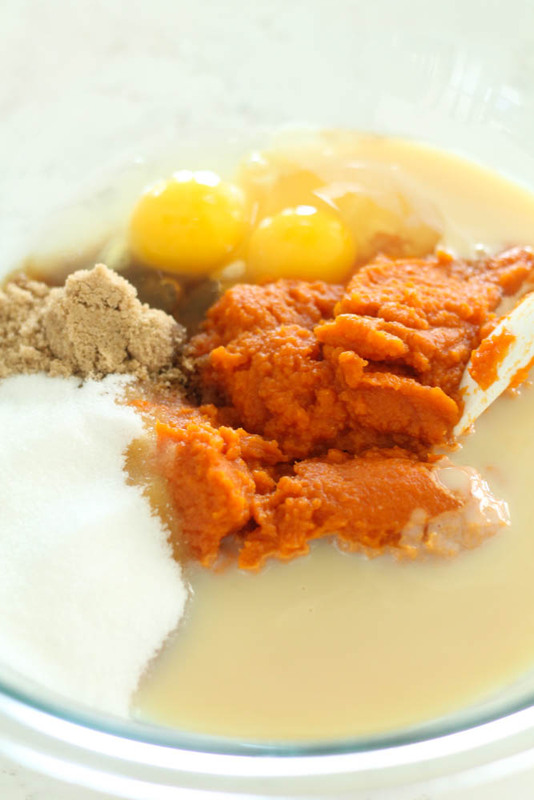 In a large bowl, combine pumpkin, sugar, brown sugar, eggs, vanilla and sweetened condensed milk. 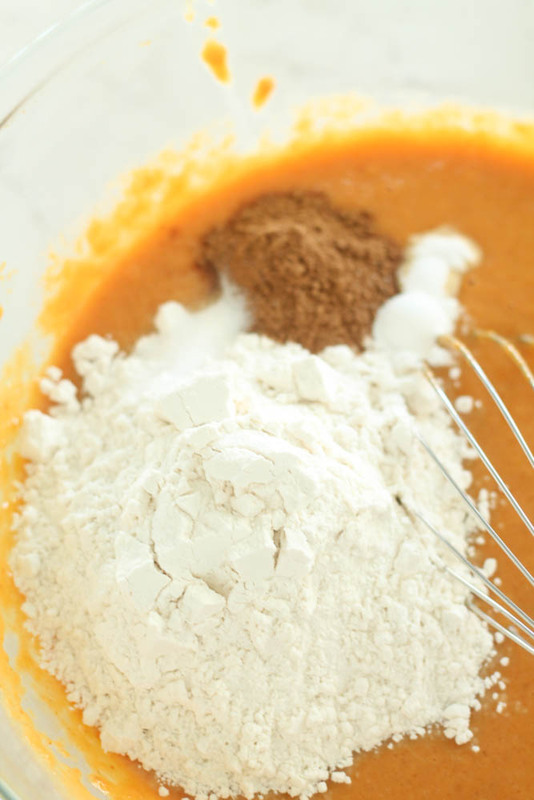 Add flour, pumpkin pie spice, salt, baking powder and baking soda and mix until well combined. Fill each muffin cup with 1/3 cup of the batter. Bake for 20 minutes, remove from oven and let cool. For the frosting, combine butter, powdered sugar, vanilla, milk and salt and beat until light and fluffy. Add more powdered sugar as needed for thicker frosting or add more milk to thin frosting to desired consistency. Pipe frosting onto cooled cupcakes and sprinkle on a little pumpkin pie spice for garnish. 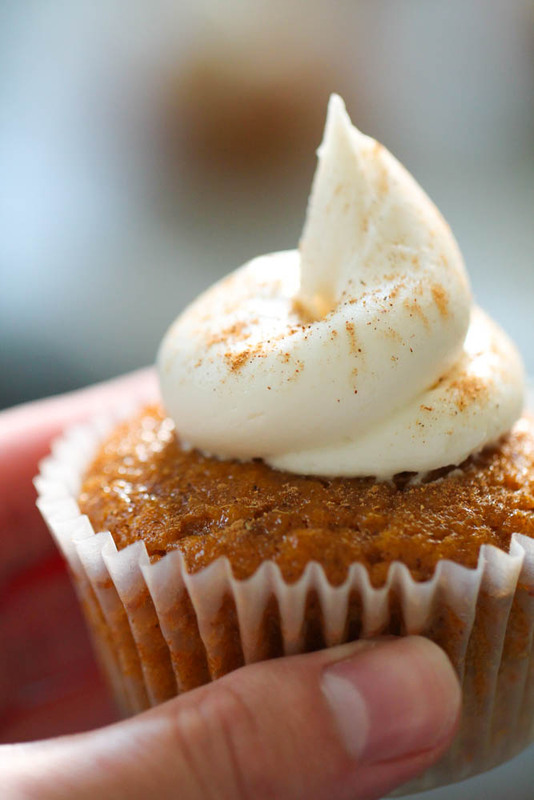 These Pumpkin Pie Cupcakes have all the delicious flavor of pumpkin pie in a cupcake! Soft pumpkin cake topped with fluffy buttercream frosting. 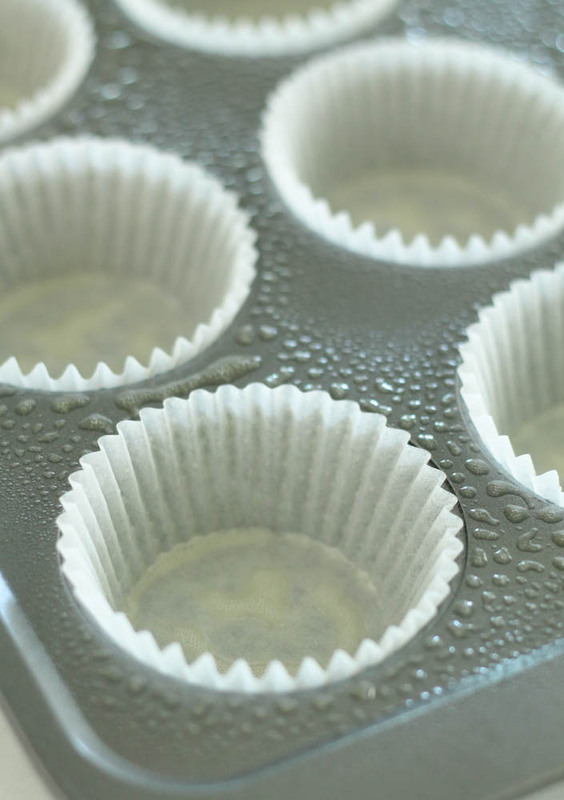 Line a muffin tin with paper liners and spray nonstick cooking spray over the top of the pan and liners; set aside. Fill each muffin cup with 1/3 cup of the batter. Bake for 20 minutes, remove from oven and let cool. For the frosting, combine butter, powdered sugar, vanilla, milk and salt and beat until light and fluffy. Add more powdered sugar as needed for thicker frosting or add more milk to thin frosting to desired consistency. I guess there are two of us who do not care for pie crust. Crust with a flour base that is. Cookie crust is another story! This recipe sounds amazing!! A must try for the holidays. You spray the paper liners? No need to spray the paper liners. I have silicon cupcake "pans" that are shaped like cupcake liners. I was wondering if that might work instead of spraying paper liners. Have you tried those? We have not tried the silicon pans. They claim to be non stick! 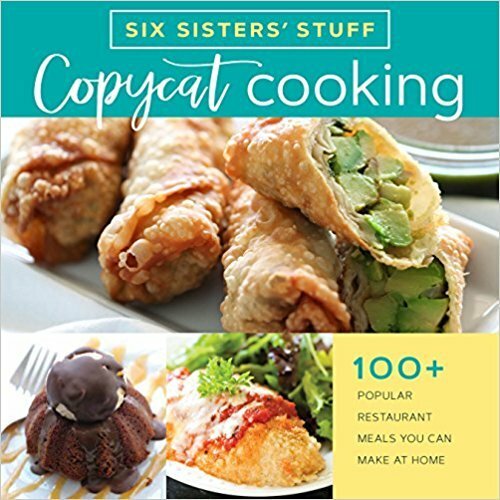 Can this recipe be made in a cake pan instead of cupcakes? We have only made this recipe as cupcakes. It should work, it only makes 12 cupcakes so it would need to be a smaller baking dish. You will have to watch closely on the length of cooking time. 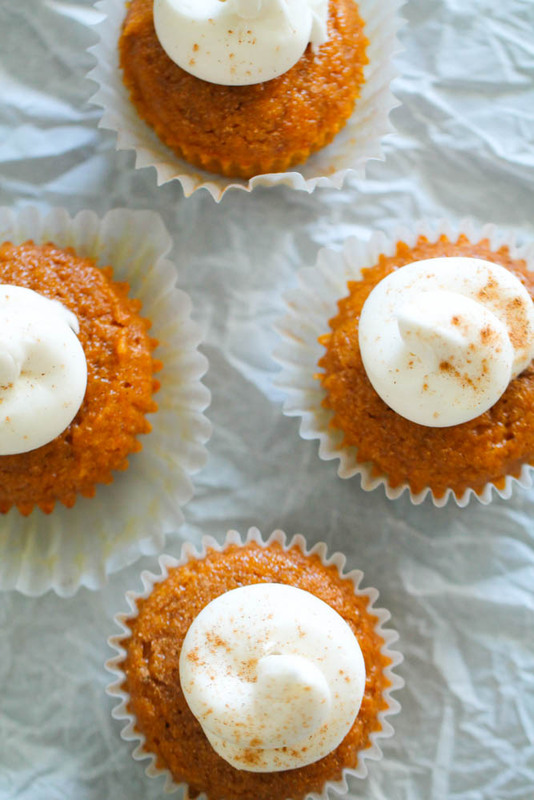 I'm not a huge fan of pumpkin pie, but these cupcakes look delicious! Pinning to try ASAP! What type of icing is on the pumpkin cupcakes and if you have the recipe on here could you provide a link? Thank you! I have made these and they are delish. I like to serve with Maple Whipped Cream and a small sprinkle of chopped nuts. Of course, they must be refrigerated if you have leftovers. Carolyn, maple whipped cream sounds amazing! Did you add maple extract to the cream? Cream Cheese Frosting: 4 oz cream cheese, room temperature 1/4 cup butter, room temperature 3-4 cups powdered sugar 2-3 Tablespoons milk 1 tsp vanilla extract Mix cream cheese and butter until light and fluffy. Add powdered sugar to butter mix and pour in milk to create desired consistency. Add in vanilla and beat frosting at medium speed until light and fluffy. Spread or pipe onto cupcakes. I always top mine with homemade eggnog whipped cream. Just find a simple whipped cream recipe, add eggnog in place of some of the whipping cream (I add to taste) and viola! Delicious! Can you add cinnamon or pumpkin spice? I've never made it, but I'm thinking it needs those spices. Looks great! 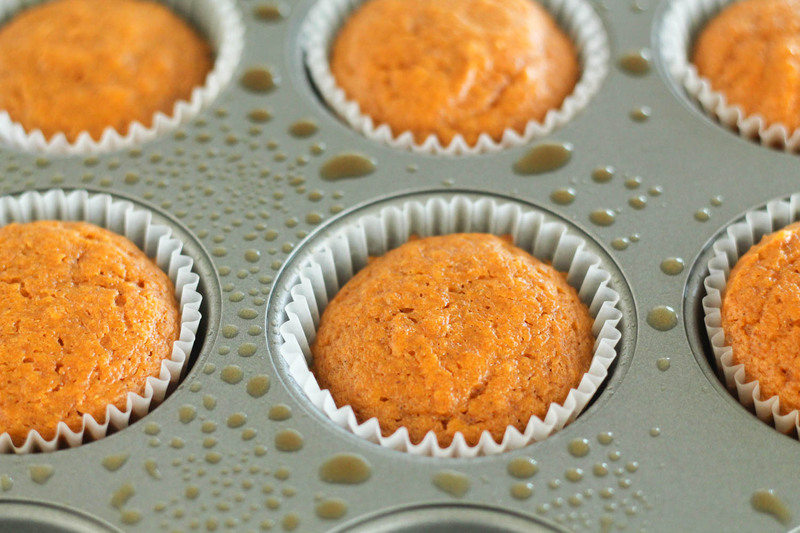 Do you use regular cupcake tins or the jumbo muffin tins? We used regular size muffin tins. Could you substitute the puree and spices for pumpkin pie mix? I made these cupcakes today for thanksgiving and doubled the recipe. All I can say is that they were awesome! Just add a little whip cream on top and you have a little piece of pumpkin pie! Thank you for a simple and great tasting cupcake! I have now made 2 batches of these for my family, and they are amazing! I forgot the spray the liners before putting batter in them the first time (BIG NO NO, lol!) These have been a big hit. I can't wait to make a big batch to take with us for both Thanksgiving and Christmas! I was wondering if these could be made as mini cupcakes? How would I adjust the temp and/or time? These will work fine as mini cupcakes. Watch them so closely because they won't take as long to cook. You can test for doneness by touching lightly with finger to see if it springs back slightly or the toothpick test. Not quite sure the exact baking time because we haven't made them in mini form yet.